This is a very popular delicacy from Chettinad cuisine. Paal Paniyaram is carefully deep fried in oil, these balls are (made with rice-urad dal batter) soaked in sweetened coconut milk.This will well observe the milk, cause you to feel the spongy and creamy while eating it.This delicious sweet served in the chettinad region during marriages and functions. Take equal measure of raw rice and urad dal and soak it together for 2-3 hrs. 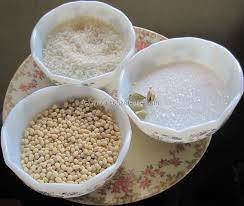 Then grind it to a fine batter(use grinder) for best results.Add very little water only while grinding.Add salt, mix well and keep aside no need of fermentation this can be done immediately.Salt is added in sweet dishes just to enhance the sweetness of the dish. The batter should be thick and fluffy like idli / medu vada batter.Heat oil in a kadai – When oil is heated up, take a small portion of batter and drop it into the preheated oil.It will puff up well. Turn over and cook on both sides to light golden color. 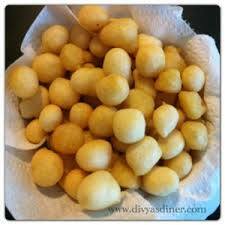 (Don’t fry the paniyarams for more time, just fry till light golden brown). 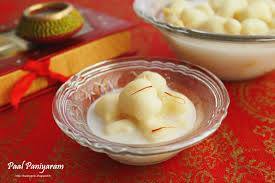 Salt is added in sweet dishes just to enhance the sweetness of the dish. Drain in a tissue paper, In a bowl, add coconut milk,milk,elachi powder, sugar and mix well.Drop the fried paniyarams into the prepared milk, let it soak for 5-10 mins. 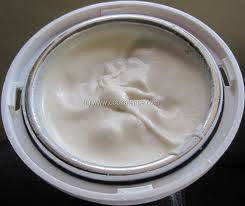 You can even use coconut milk fully or use the ratio of milk: coconut milk as I have mentioned. 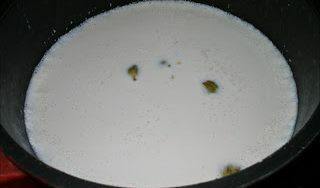 You can fry the paniyarams before hand and dip in the warm water before you soak in milk. while serving time just soak them in milk. Adjust sugar quantity according to your taste.cardamom or saffron can be added for flavour.